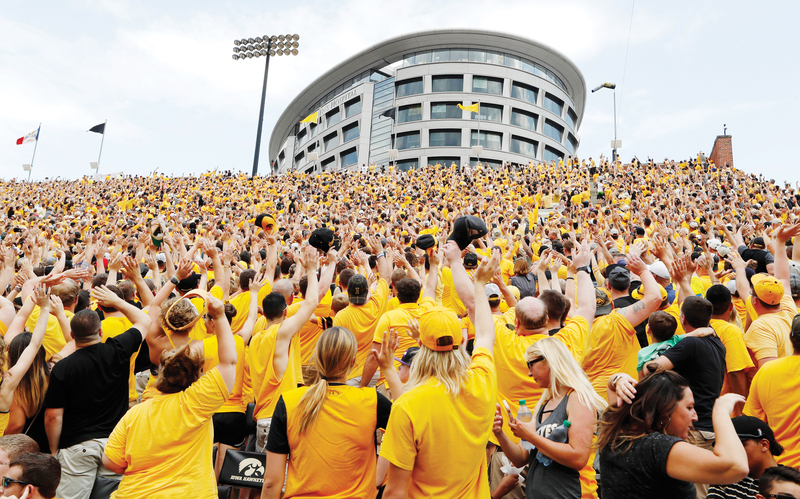 AP Photo Hawkeye fans wave to the University of Iowa Stead Family Children’s Hospital during a game earlier this season at Kinnick Stadium in Iowa City. IOWA CITY — Nine-year-old Maddox Smith can no longer play football, not after being treated for a golf ball-sized brain tumor and a rare genetic disorder that caused tumors to grow on his nerve cells. Maddox has spent many, many days in the hospital. Like dozens of other children slogging through long weeks of recovery, he also has been part of college football’s newest and most heartwarming tradition. “The Wave” has become a national sensation, with nearly everyone in 70,585-seat Kinnick Stadium turning to wave to the pediatric patients watching from University of Iowa Stead Family Children’s Hospital — a 12-story building that sits right across the street — at the end of the first quarter. The gesture was born through a combination of limited space, social media and the “Kid Captain” initiative, a partnership with the Iowa football program designed to highlight the youngsters fighting so bravely nearby. The Hawkeyes honored Maddox before a recent game through the “Kid Captain” program. He got a jersey, tickets, a standing ovation at midfield and, most importantly, a welcome distraction after years spent fighting for his life. The story of “The Wave” actually dates to 1919, when the university opened its original children’s hospital at the location of the current one. The University of Iowa Hospitals and Clinics opened close to the pediatric facility in 1928. Kinnick Stadium was built a year later, separated from the children’s facility by a tiny two-way street. Since few could have envisioned how much college football and the needs of the hospitals would grow in the decades to follow, sharing such a small footprint didn’t seem like a problem. Kinnick Stadium went through multiple renovations and expansions over the years. But the side of the field adjacent to the hospital had to be left alone because there simply wasn’t any room. When it came time to build a new children’s hospital , designers were forced to get creative because the facility had to remain connected to the school’s other nearby hospital. Thus, a new hospital — with pristine views of the field — was opened in 2016. According to Scott Turner, the executive director of the hospital, designers accentuated the locational quirk with what they call the “press box,” an event and game-watching space for patients and their families, on the top floor. On game days, patients and their families can watch the game and, after the first quarter, wave back. “We know that providing distraction and a sense of normalcy allows people to escape the type of things that they’re dealing with,” Turner said. The viewing perch has helped strengthen the bond between the Hawkeyes and the hospital, one that coach Kirk Ferentz — who in August donated $1 million to bolster research into helping premature babies — made official in 2009 with the “Kid Captain” program. Thousands of parents have nominated their children to be part of the program, which has also led to similar efforts at UCLA, Minnesota and Iowa State. While the proximity of the hospital and the stadium, the relationship between the team and the kids, and the fan base known for being “Iowa Nice” laid the roots for “The Wave,” Facebook brought it all together. Iowa fan Krista Young posted the idea of waving to the hospital’s press box on the “Hawkeye Heaven” page, which has over 100,000 followers, in June. The idea soon caught fire, and after the first quarter of Iowa’s season opener on Sept. 2, tens of thousands of fans got up from their seats and waved. The kids and families responded, and “The Wave” was born. The Hawkeyes and their opponents have joined in on the fun, with Minnesota coach P.J. Fleck calling it his favorite tradition in college football. Amy Clark’s son, Ethan, was at the hospital to be treated for acute lymphoblastic leukemia. As the Hawkeyes prepared to play Minnesota last month, she thought about “The Wave” and what it means for the children — and their loved ones.